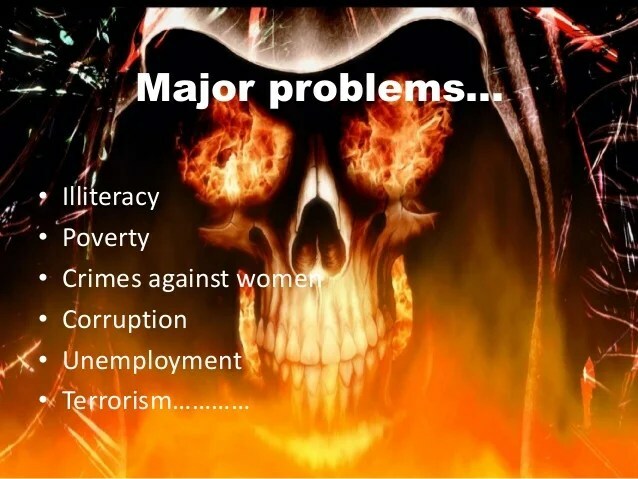 There were thousands of problems in India such as over population, illiteracy, unemployment, shortage in food, water and electricity, poverty, drainage system, over prices of rice, pulse, vegetables, law and order, corruption and many more problems in India. Due to this many demonstration by political parties and several organizations conducts loss of crores In India. When the elections like Lok sabha and Vidhan sabha elections were conducted leaders of different political parties promises of solve difficulties of people but after elections no one leader interested in solving difficulties of people of India. Unemployment is the main problem in India due to over population and less investment causes a threat to law and order situation, poverty in India. But no one is working is solving problem. The Overpopulation is a mother problem in India. If the population were reduced month by month or year by year there were many difficulties were automatically solved such as illiteracy unemployment, poverty. Over population is a problem is solved by own but people of India were not interested. In the name of religion and for born priority to boy there were many girls born and greed for large money due to large number of boys is the main reasons of over population. Recently giving to importance to boy there were many girls were killed before born is also a problem causes a change in ratio of boys and girls. There were many schemes conducted for this major problem but increase day by day population in India and causes many problems lack of jobs, schools, electricity, food, colleges the basic facilities were in shortage generates high price rise in school fees, electricity, rice, pulse, vegetables, fruits. The Prime minister and each chief minister of different states promise of resolving a problems but a process of solution of problem is very slow. There were increases crowded in cities, railway stations, bus stands, markets, schools and colleges, religious programs causes a stampede. Due to stampede more of the people were killed in many areas such as religious programs, railway station and bus stand were incident caused by an over population. The increasing population also causes water crisis in various parts of India. It is a very huge problem in India. 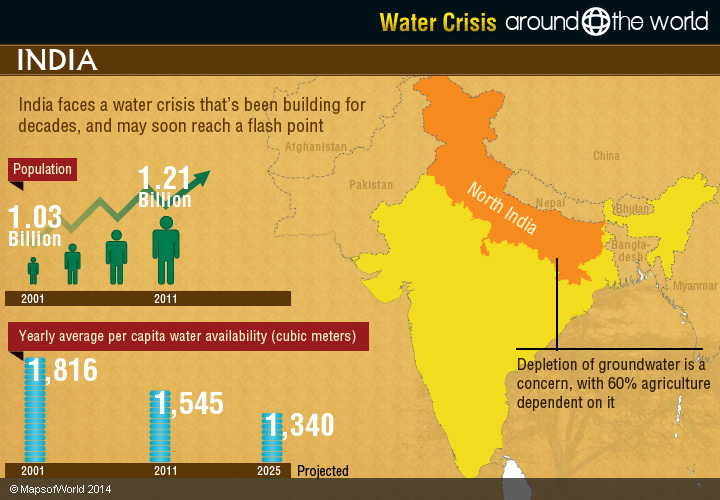 The decrease in level of water in ground and in major rivers also an causes major water crisis. The majority of agriculture depends upon water. If this problem will not solved then affect the production of crops like rice, pulses, several vegetables and fruits. If the Prime Minister, Chief Ministers of various states were not involved in solving a problem then in future then the situation is very serious and threat to our country. If the leaders and People of India were decided to solve this problem then first of all work in reduction in population.Religous leader were also involved then the process of solving a problem of over population and also to improve boys girls ratio is fast due to the most of the different religions of people were believe in different religious leaders and follow the different religious leaders. When the process of resolved a problem of over population is fast then many problems were solved automatically such as unemployment, poverty, high price rise, reduction in crowd in each public places and stampede. The people of India should change thought about girls and give also priorities to born a girl in compare of boys causes to huge change in boys girls ratio. When the people change the thought and giving priorities to girls then reduction in born of kids and improve in ratio of boys and girls. The Prime Minister should declare overpopulation is a national problem and take interest resolved a problem because over population is a mother of various problems and if the process is fast then various problems were automatically solved. Next Post What are overpopulation and its effect on the environment? Population measures definitely will solve things but more than government people themselves have to understand and take measure. Yes as role of government definitely strict measures like teachers should be take along with awareness camp and incentives to be given.